If you're planning an African safari, you'll know that the term 'Big Five' is one of the most commonly used marketing slogans in the safari industry. Game reserves that host the Big Five will usually use this fact as their biggest selling point—but what does it mean? 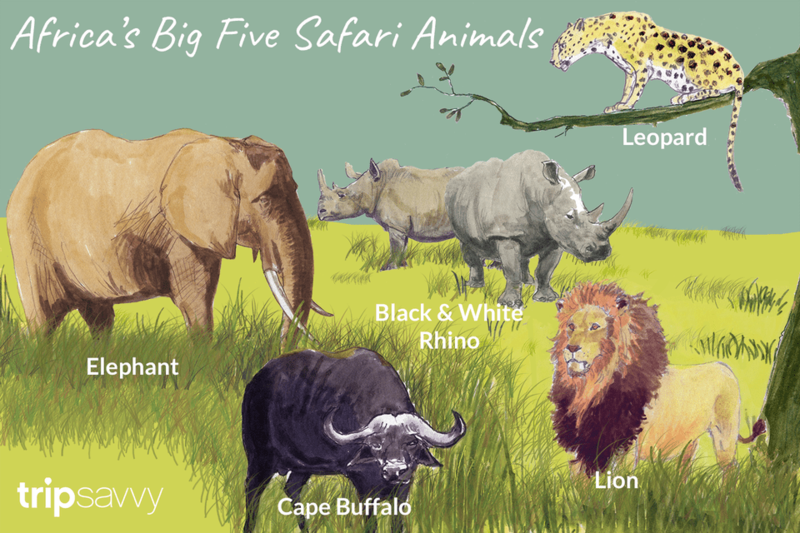 In the game reserves and national parks of Southern Africa, the Big Five represents safari royalty - the African lion, the African leopard, the African elephant, the Cape buffalo, and the rhino (either white or black). The phrase was originally coined by early game hunters who recognized that these species were the hardest and most dangerous animals to hunt on foot. This made them the biggest prizes, hence, the Big Five. Today, the phrase has come to represent the most sought-after safari sightings—although, in reality, this is a matter of personal preference. Some of the most endangered, beautiful or charismatic African animals don't feature on the Big Five list including the cheetah, the African wild dog, the giraffe, and the hippo. The African elephant (Loxodonta africana) is the world's largest and heaviest land animal, with the biggest individual on record weighing in at over 10 tons/22,000 pounds. They are found in 37 sub-Saharan countries and are capable of surviving in a wide range of different habitats, from lush wetlands to arid deserts. African elephants are supremely well adapted to their environment, from their inch-thick skin (which protects them from the sharp thorns of the bush) to their enormous ears (which help to disperse heat and regulate body temperature). They can consume up to 50 gallons of water and 375 pounds of vegetation every day. Elephants are very social animals. They live in matriarch-led groups that often number more than 100 individuals and communicate using a variety of low-frequency rumbles that can travel for many miles. Female calves usually stay with the herd throughout their life, while young males leave to form bachelor groups and to eventually create herds of their own. In the 1970s and '80s, the global demand for ivory led to a dramatic decrease in elephant numbers. A ban on all ivory trade has helped stabilize the population to around 600,000 in the last decade, but poaching is still a major issue especially in parts of Africa where there is political instability. As such, the African elephant is listed as Vulnerable on the IUCN Red List. Where to See Elephants: Chobe National Park, Botswana; Addo Elephant National Park, South Africa; Hwange National Park, Zimbabwe; South Luangwa National Park, Zambia. The African lion (Panthera leo) is the undisputed king of the sub-Saharan savannah and is the world's second-largest cat after the tiger. Although lions sometimes hunt during the day, they are typically more active at night which is why most daytime safari sightings are of cats sleeping in the shade. Lions can sleep for up to 20 hours a day. Unlike other cats, lions are very social animals. They live in prides usually consisting of one (or sometimes two) males, several females, and their cubs. Lionesses usually do the hard graft when it comes to hunting, often working together to bring down larger prey. They are ambush hunters, using their tawny coloring as effective camouflage. In the wild, lions can live to around 14 years of age, although most prides experience a high rate of cub mortality, while males often die whilst fighting to protect their territory. Female lions are able to synchronize the birth of their cubs so that they can help each other to raise them. Cubs are born with rosette markings that fade over time. Lions have few natural predators, although buffalo will often trample cubs. Predictably, man is the species' biggest threat. Traditional hunting customs, big game hunters, and large-scale habitat loss have all contributed to declining lion populations in Africa, and as such, the lion is also classified as Vulnerable on the IUCN Red List. Where to See Lion: Kgalagadi Transfrontier Park, South Africa; Okavango Delta, Botswana; Maasai Mara National Reserve, Kenya, Ngorongoro Conservation Area, Tanzania. The African leopard (Panthera pardus) is the most elusive of the Big Five animals. Naturally shy and exclusively nocturnal, leopards spend the daylight hours hidden from view. They are excellent climbers, using trees to scan for prey and to store fresh kills away from scavengers like lions and hyena. If you're looking for leopard, remember to look up. Leopards are superbly camouflaged with a series of black spots, or rosettes. They have large territories and seldom stay in the same area for more than a few days. Males range more widely than females and mark their presence by urinating and leaving claw marks. They are supremely strong and can take down prey much larger than themselves. Their hunting prowess relies on their ability to run at speeds of over 35 miles/ 56 kilometers per hour. They can also jump over 10 feet/3 meters into the air and are excellent swimmers. Leopards are distributed throughout sub-Saharan Africa and are one of the few big game species still found outside national parks. White spots on the tip of their tails and the back of their ears make mothers visible to their cubs even in long grass. As with the other Big Five species, leopards are threatened by humans. Encroaching farmlands have reduced their habitat, while farmers often shoot them to stop them from killing their livestock. They are listed as Vulnerable on the IUCN Red List. Where to See Leopard: Londolozi Game Reserve, South Africa; Moremi Game Reserve, Botswana; South Luangwa National Park, Zambia; Samburu National Reserve, Kenya. Cape buffalo (Syncerus caffer) are found in water-rich game reserves and national parks throughout sub-Saharan Africa. There are four sub-species of Cape buffalo, the largest of which is the one most commonly seen in East and Southern Africa. Cape buffalo are formidable creatures and have earned themselves a reputation as one of the most dangerous animals in Africa. They are often bad-tempered, especially when threatened, and are equipped with a fused set of deadly curved horns. Male buffalo can weigh as much as 920 kilograms/2,010 pounds. Despite their fierce reputation, buffalo are relatively peaceable with one another, sometimes congregating on the open grasslands in herds of over a thousand individuals. They are protective of their weaker members, often forming a defensive circle around sick or young animals when under attack from prowling lions. Cape buffalo need to drink every day and are often found close to water. They eat tall, coarse grass and bushes, and as such cannot live in the desert. Cape buffalo continue to be one of the most sought-after trophy animals for big game hunters, and they are exceptionally susceptible to domestic cattle diseases like rinderpest and bovine tuberculosis. Where to see Cape Buffalo: Kruger National Park, South Africa; Chobe National Park, Botswana; Katavi National Park, Tanzania; Lower Zambezi National Park, Zambia. There are two species of rhino in Africa: the black rhino (Diceros bicornis), and the white rhino (Ceratotherium simum). Both are at risk of extinction due to the poaching epidemic caused by the demand for rhino horn in Asian cultures. It is estimated that there are around 5,000 black rhino and 20,000 white rhino left in the wild. Already, three sub-species of black rhino have been declared extinct, while the northern white rhino is now extinct in the wild. Conservationists are working tirelessly to protect the remaining sub-species, but their futures are far from secure. The black rhino is listed as Critically Endangered on the IUCN Red List. Despite their names, there is no difference in color between the black and the white rhino. The easiest way to tell the species apart is to look at their lips—the black rhino's are pointed and prehensile, while the white rhino's are flat and wide. The Dutch word for "wide" is "wijd", and it is a mispronunciation of this word that gives the white rhino its name. Black rhinos are usually solitary and have a reputation for being bad-tempered, while white rhinos often live in pairs. Black rhinos prefer desert and scrubland areas and are herbivorous browsers; while white rhinos graze on areas of open savannah. It is thought that rhinos have roamed the African plains for 50 million years.